Another new $$$ book from our community hits the shelves today! Summary and giveaway details as we do are below, followed by her tour dates in case you’re able to stop by and have some fun in person too. Because if there’s anything better than talking about $$$ online, it’s talking about money in REAL LIFE! 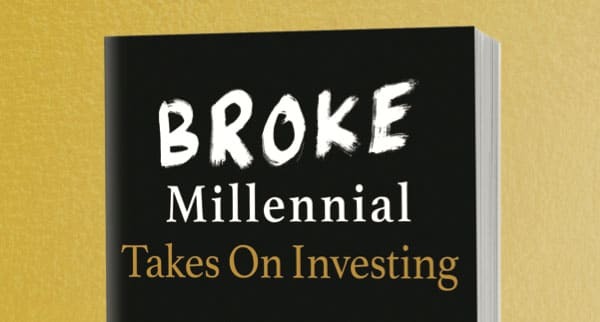 In this second book in the Broke Millennial series, Erin Lowry answers those questions and delivers all of the investment basics in one easy-to-digest package. Tackling topics ranging from common terminology to how to handle your anxiety to retirement savings and even how to actually buy and sell a stock, this hands-on guide will help any investment newbie become a confident player in the market on their way to building wealth. What’s the biggest fail you’ve had so far with investing? Good luck!!! And huge congrats Erin!! Hmm, the biggest fail I’ve had investing so far…i guess the big one was not cashing out my bitcoin at the top of its peak last year. I waited too long to see if it would continue to go up, and then it fell back down hard. I did still make money off of selling, which I then immediately reinvested once it fell even lower. But I could have made more off of the sell and thus reinvested more if I hadn’t waited so long! I tried “investing” in it for about a month and that was as much as I could take, haha… Cashed it out and then literally the next week the crash came! When I was really young, I was invested into a Janus mutual fund that made a negative return. I didn’t know anything about investing but If I had I probably would have a good bit more since I did start so young. When I got started my work career I took the Money out of the mutual fund and rolled it into my company stock which has turned out to be a great investment. Biggest mistake would have to be falling for a ‘big name’ and buying their expensive actively managed fund. Needless to say the performance was terrible. Index trackers all the way from then on! A good lesson to learn earlier than later! When we’re talking a lot more $$$! Did you know there’s *ONE* last store around these days, which is now a tourist destination?! It’s in Bend, Oregon :) You should visit it! The biggest fail I’ve had investing, is always backing down right before I should do it. I let the fear and what ifs get in the way! I suppose my biggest fail with investing is that I haven’t really started. I have a 401k (opened by default when I started working which ultimately is good because I probably wouldn’t have one otherwise). I left the company and started school again. At that point I guess my biggest fail was rolling it over to IRA and letting it sit as cash for approx 2 yrs. I had no clue what I was doing (and still don’t). Now that I am out of school I hope to start figuring out this whole investing thing and regularly contribute to it again. At least you rolled it over instead of cashing it out like a lot of people do!! my biggest fail with investing is that i haven’t figured out or have even started investing yet. i don’t know where to begin. also i have a ton of student loans and live paycheck to paycheck. i don’t have a clue as to what i am doing and want to learn more. As an old (broke af) millennial (34) my biggest mistake has been not investing. I was in the workforce for like 15 years without so much as a retirement fund. I’m in a job now where I’ll probably stay for life and have a defined benefit plan and I did just start putting a little money (about $40/month) into my 403(b) as well. I plan to up that amount as I pay off debts, but it’s definitely feeling like too little too late. My biggest investing fail was not maxing out either my or my husband’s 401k earlier on. I’m definitely passing that advice on to my millennial so she can reach FI faster. My biggest fail was not getting started sooner! My biggest fail? Not being consistent about saving. Quite a few years back I set up an automatic monthly investment but it was only $50. I could have easily afforded much more,and I probably would have never missed a penny. Woop for world-wide give aways! I think my biggest investing fail is not educating myself. I have some money in a fund but I was persuaded to keep it low risk, I didn’t have enough knowledge to know if this was good plam or not- still don’t- and I need to learn. My biggest fail was starting with an advisor who put me into an annuity contract (CD type) for my IRA. When he wanted me to sell that contract (and pay the huge redemption charges) and invest in another IRA a year later I had started to gain enough knowledge on my own to know he was in it only for the commissions. I continued gaining knowledge and experience (sometimes the hard way) and was able to comfortably retire at 57. I went from Broke Baby Boomer to living the good life. Some advisors really are the worst, ugh.. When I was in college I invested $500 into 5 different stocks, $100 into each. 3 of the 5 stocks became worthless virtually overnight while 1 held its value. But the 5th stock was in a pharmaceutical company and they patented a drug and prices skyrocketed. I was down 99% on the first 3 stocks but I was up over 800% on the pharma company. Rather than selling some of it I decided to ride it out because I was emotionally attached to it. A few months later they got wrapped up in a legal battle over undisclosed side effects and I lost it all, but I learned a valuable lesson: don’t try to day trade stocks. So now I just invest in index funds and call it good. It was probably the most important lesson I learned in college and only cost me $500 so I’ll call that a win. i would agree with that 100%!! 2) Playing with day trading. Made some money. Lost some money. End of the day for me it was just gambling, and not something that ended positively. My biggest fail is NOT STARTING SOON ENOUGH. Working on building up (faster) now! I may not be a millennial, but i definitely could use some help / kickstarting! It took me a while to figure out #2 up there myself… even being a financial blogger for years before hand! My biggest investing fail…would be not starting sooner! But thankfully i am (slowly) remedying that! My biggest investment fail so far: Snapchat. I’m glad I bailed when I did or it would have been a whole lot worse. haha… I don’t follow it at all, but I sure haven’t heard about them like I used to? Biggest investment fail has been not starting soon enough. I am a broke millennial with student loans, and really need to learn more about how to invest responsibly while paying off debt. Thankful for my retirement account (does that count as an investment?) but looking forward to getting in a bit deeper. Mine was buying an investment I didn’t understand based on a broker’s advice – buy a bond fund. I was told it was safe, etc. Imagine my surprise when the value per share went down and the broker said when the interest rates go up, the value goes down . . . needless to say, when I was about even, I jumped out. Jeez… my biggest fail was not taking control of my investments long before my divorce. I let my ex manage everything which obviously was a huge mistake. I’ve since moved away from big investment to a roboadvisor but really need to understand more. Lol. Hence, I can’t wait to gets some knowledge on investing. My biggest fail is probably leaving so much money in my regular checking account. I know I need to use money to make money, but I worry a lot about putting it in the right places, and I’ve been a little paralyzed by choice. Hopefully this book will help, thanks! Ugh, this is painful to think back on but liquidated my 401 in 2000 when I left that company. Kinda needed it for some unexpected expenses, but thinking back I should have side hussled more to make up for them. My biggest is fail is being afraid to invest! I mean, I invest in my 457 and IRA but that’s it – and fear is the reason why. My biggest investment fail as a younger millennial was not immediatly investing in my employer sponsered plan when they offer an employee match for about three years. Not opening a Roth IRA when I was the “Smoothie Queen” at 16 years old where I worked during my high school summers. My biggest investment fail to date is investing a large chunk of money in a friends business that I really believed in and did a lot of due diligence on. Ultimately they couldn’t get the main financial backing they needed to scale and they had to shut down and I lost everything. Still in my twenties, so time to recoup, but still a heartbreak as that money could have gone a long way as we are working towards purchasing a house now. At least it was something you believed in and researched though!! Could have very easily gone the other way in an alternate world! I think my biggest investing fail is being too scared to invest! I’m 23 and just graduated from college, and have some general anxiety around money that makes me feel like parting with it – even when I KNOW I’ll be making more off it if I do – is too scary. I do put 5% of my paycheck into a retirement account (and soon I’ll unlock my employer match!) but I know I could be doing more…I just don’t really understand the concrete next steps I should be taking, and I’m a little too scared to research them myself. That’s what I’d hope a book like this one could give me a kick in the pants with! My husband managed our investments and when he died very unexpectedly at the age of 51, I was too devastated to function for about a year. As I finally began to come out of the fog I let my CPA who is also an investment person manage my finances. He charged me 4% per year and I lost money. It took me several years but I finally took it back into my own hands and IMMEDIATELY made money. I am very leery of trusting someone else now and my return on investment last year was outstanding. He can do my taxes, but I would never trust him to help me make my retirement secure. Damn, sorry to hear :( As if losing your husband wasn’t enough! When I was young and just getting started I’m invested I followed the advice of a friend on a hot stock tip. Needless to say I lost a few grand and learned an important lesson. Always do your own due diligence!! My biggest investing fail was waiting so long to get started! I literally just got into the market LAST MONTH, and I wish I had started way back when I first started working. That said, better late than never! Great advice from both of you and thanks for helping the investing clueless like me. Since this contest is open worldwide, I thought I might as well give it a try. My biggest investing mistake would be ‘investing’/jumping into penny stocks when I was new to investing and didn’t have much prior knowledge. Since then I have learned not to treat investing as speculation and do more research. My biggest fail? When I first got out of college I listened to a co-worker about a ‘guaranteed” high return investment. I went with him to a meeting and got sucked into handing over $400 cash with a promise to double my money. Well, turns out that it was a ponzi scheme and I was on the tail end so the whole thing failed and I was out $400. Tough lesson learned. And to this day that co-worker is not on my christmas card list. In 2007 my husband wanted to by gold…we let a financial advisor talk us out of it…prices tripled that year…..
Off the top of my head, my biggest investment fail was the result of overconfidence. After investing years in stocks, I decided I wanted more upside potential in my investments. I started to tip my toes in option investing. My first foray into options, I sold a put option on Microsoft. It expired without exercise and I pocketed the premium. Made a few grand off of it. With this win, I decided to up the ante on the next option investment. I purchased a put option for $35,000 on a stock and thought that stock would surely fall in price. Unfortunately, the stock sky rocketed. I held onto my options and they expired worthless. I lost the entire $35,000 amount. That was the last investment I’ve made in option investing and that was about 10 years ago. My huge investing fail was because of an investing “win” – it was in 2012 and I was becoming more comfortable with investing on my own. I had invested in a few really good individual stocks and mutual funds, made some money, and got cocky & stupid. The ETF did a series of splits over the next 18 months because it did so bad and my investment eventually went to $0. I lost about $6K, which would have been a TON had I known the difference between an index fund and an ETF from 2012 to today! 2) My investing behavioral psychology was WRONG! I thought I could “outsmart” everyone and that “what goes down must come up” – NOT when it’s an ETF! Could it have happened? Sure. Did it? Nope, I took a 100% loss. 3) This pushed me to take a step back and I realized that I hadn’t made money up to that point because I was so smart, but rather 10% my smarts/work and 90% luck/timing. It pushed me to dive into reading more about investing. These should save you a $6K mistake! Good luck! All very excellent books too – thanks for passing these forward for people to see! To date – I put $500 in Bitcoin early 2018…it was at a low of $120 in December and it actually at $200.00. I’m taking it as a loss, but going to leave the money in it for a few years – hey, maybe just maybe I’ll make my money back with another surge – those Winklevoss are relentless. Besides that, I’d like to learn more about investing. I’m sinking funds into my Roth IRA and 401K now regularly and more aggressively at the age of 40 – I regret not starting earlier! And am now educating myself slowly with investing – this book would help! Not rolling over my IRA $ from my last job soon enough. Those few months it could have been earning more in a ROTH IRA than the CD it was sitting in. Also (not the biggest but worth an honourable mention) investing $ in GE and Ford when they were at their last high $30 and $14 respectively. A few months ain’t bad! My biggest investing fail so far was putting a big chunk of my 401K portfolio into target date funds. I didn’t know a whole lot about investing at that time and just relied on the Fidelity advisor to tell me where I should put my money. A year into investing at target date funds, I realized that the fees for these funds were really high asset allocation in these funds didn’t really meet my investment goals. There could have been worse ways to invest in!! Like all cash! :) Or who knows what other funds employers offer up – i’ve heard of some nasty ones! My biggest investing fail really just has to do with not starting earlier! We had accumulated 6 figures and kept talking about what we should be doing with it, but it still took longer than I would like to admit to invest our excess funds in the market. Oh wow – at least you got the hard part out of the way!! Stashing 6 figures is no joke! I was gonna buy Netflix when it was first starting out and taking on blockbuster, but my dad convinced me not to. Doh! My biggest fail was investing in companies only because I knew the names or used the products, instead of doing actual research on the fundamentals … bad idea! My biggest money fail is not being aggressive about paying off debt. I always assumed it was just part of life. Once I started the debt snowball and focused I knocked it out fast. Wish I hadn’t waited so long to send extra payments. Ya live amd ya learn. My biggest fail was investing in Bitcoins when they were at top price $19000. My friend kept telling me that he is reading a lot of blogs that say that it will continue to grow to $72000, so I got greedy and decided to invest in it. I didn’t learn from my mistake and invested some more when prices when down on Lite coin. Now my investment is work 25% of the actual amount that I invested. So I decided to leave that money there and see what’s going to happen over months/years. My biggest failure in investing so far has been jumping into the cryptocurrency hype when that space was blowing up. I actually made two mistakes, investing without truly understanding and then not pulling out when the crypto world was at its height! Now my investments are in the negative but I’m still holding on, bc my stubborn self thinks it will make a comeback ;) we shall see. All my subsequent investments have been in more stable vehicles, 401k, Roth, and 529 plan. Not starting to invest in my work 403b early enough. I was investing in in a taxable account and was reluctant to give up the extra flexibility of doing so. But once I started maxing out the 403b and saw that I was facing significant tax savings…I was a convert. Big congrats to Stephanie C. and Chase for winning free copies of the book!! Next post: Should we go for a 15 year or 30 year mortgage?